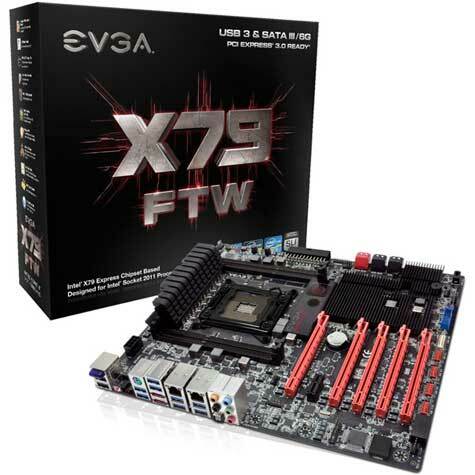 After the announcement last month , here is the EVGA X79 FTW motherboard ( EATX form factor with with 3-way SLI support) see the light at the market places and ready for the public hands, the price tag is $399.99 in retail, and only available at EVGA website, soon to be at other seller. Specifications and features: Graphics cards can be installed in the five PCI Express x16 slots available, which are accompanied by an additional PCIe x1 slot for less pretentious add-on cards. The rest of the expansion options include support for two SATA 6Gbps and four SATA 3Gbps drives, while on the rear I/O panel users will find other two extra eSATA connectors. These are accompanied by no less than eight USB 3.0 ports driven by a VIA Labs controller, two Gigabit NIC’s, 8 channel audio with S/PDIF out, a Bluetooth transmitter and a connector for EVGA's EVBot. Two additional USB 3.0 ports are available through an on-board header, so the X79 FTW is definitely a motherboard that isn't lacking in this department. Power to the board is provided via two 8-pin CPU power connectors and an angled 24-pin power plug, and throughout the motherboard EVGA has used only POSCAP capacitors. This is just one of the features meant to improve overclocking on the X79 FTW, as the board also includes a series of DIP switches for disabling each one of the five Gen 3 compliant PCI Express x16 slots installed and DIMM sockets, a rear panel Clear COMS button as well as the usual on-board Power and Reset buttons.